The new political party Aontú led by former Sinn Féin TD Peadar Tóbín is running 60 candidates in the forthcoming local elections. Speaking at a meeting of party candidates in Ballyfermot in Dublin today, Mr Tóbín said they have now formed 65 Cumann throughout the country. "In three months we have held 40 public meetings throughout the country. No other political party has engaged at such a community level with the people of Ireland for many years. Well over 5,000 people attend those meetings," he said. The Meath West TD said the largest portion of their membership is drawn from people who have not been involved in politics before, however many of their elected representatives had left other parties to join them, including Fianna Fáil, Sinn Féin, the SDLP, Fine Gael, the Labour Party and the Green Party. "Many are sick and tired of the membership dis-empowerment of those parties and the disconnect that exists between these leaders and the workers on the ground. This diversity is one of the major strengths of Aontú," says Mr Tóbín. The party is also expected to run a number of European election candidates. 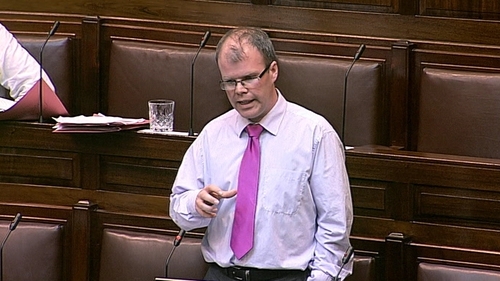 Mr Tóbín left Sinn Féin last year after being suspended for voting against abortion legislation in the Dáil. He said the party is in discussions with a number of people to run in the European elections and he expects to announce candidates in the next ten days. Meanwhile the Social Democrats also announced today that it is running 60 candidates in the local elections. The party said the majority of their candidates are new to politics, but many have experience of working in the Marriage Equality and Repeal referendums. Co-leader Catherine Murphy TD said many of their candidates had "already helped to change the country by their actions". The party also said a review of the candidacy of Ellie Kisyombe, who has lived in direct provision, is complete and will be considered by the party executive. The review was ordered following newspaper reports of inconsistencies in Ms Kisyombe's background. "I haven't seen the report. We will make a decision when we see the review," co-leader Róisín Shorthall said. The Social Democrat's Dublin councillor Gary Gannon is to contest the European elections in the Dublin European constituency. The Labour Party has said they have currently selected over 100 candidates in the local elections, including dozens of first-time councillors. Party leader Brendan Howlin said he would be asking Labour supporters in the local and European elections to give their lower preferences to "other progressive parties, including the Green Party and the Social Democrats".